In contrast to publishers complaining about Apple's subscription pricing, Bloomberg says it is "pleased with Apple's terms," and that "iPad is the most important place to be right now, and thats where were focused." 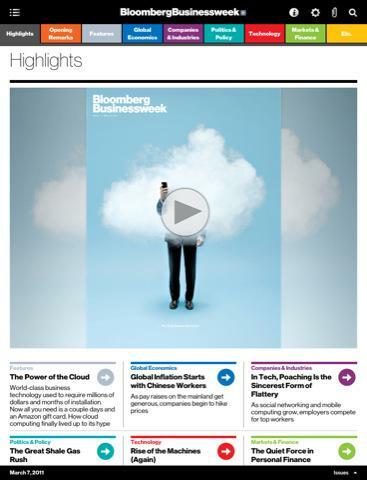 The publisher has launched its new Bloomberg BusinessWeek app with a $2.99 monthly subscription, or free for existing subscribers of the print version, according to PaidContent. 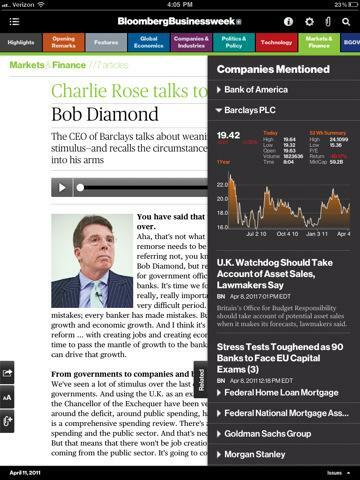 The free app includes an initial free edition of the magazine to review, including a video on how the cover art was designed and audio of Tom Keenes Econochat and a Charlie Rose interview. New weekly editions will be published each Thursday evening. Apple first released its in app subscription plans for iPad in February, resulting in a backlash of complaint from a variety of publishers. It was also widely reported that Google would take away Apple's subscription business with its cheaper, web-centric One Pass program. While many reports suggested that publishers were refusing to pay Apple the same 30 percent cut it charges for other App Store transactions, the main sticking point for most publishers was the opt-in model Apple chose for subscribers, which only let publishers get the identity of subscribers if the subscriber elected to share their personal data. Neither point was issue for Bloomberg mobile head Oke Okaro who stated in an interview "we are very pleased with Apples terms," while noting that he expects subscribers will willingly volunteer the personal information that publishers value. The new BusinessWeek app is unique in a number of respects. Rather than being a giant graphic output like some previous attempts at iPad publications, the new app adds social links, virtual clippings for sharing, interactive media and graphics while remaining relatively slim at just 30MB per issue (less than a tenth the size of Wired). The $2.99 per month pricing is also simple and affordable, compared to the oddly confusing and relatively expensive packages recently released by New York Times, which has separate tiers for iPhone and iPad use and range from $15 to $35 per month for its various digital plans. Okaro said Bloomberg had been working to refresh its newly acquired BusinessWeek in print before building its iPad edition, but had no announcements to make about digital delivery on other non-iOS platforms. "The iPad is the most important place to be right now, and thats where were focused, he said.